Собака кошку недолюбливает… мягко говоря. Мы знаем примеры, когда даже животное бросалось в огонь спасать своих детёнышей. Вспомним историю кошки Скарлет, которая вытащила из огня пятерых своих котят. Скарлет сильно обгорела. У неё заплыли от огня глаза, обгорели кончики ушей, была обожжена морда. Но она шла в огонь снова и снова, и вытащила-таки всех малышей. Она не могла их видеть, потому что не могла уже открыть глаза из-за волдырей. И вытащив последнего, она стала тыкаться в них носом, чтобы удостовериться: все живы, все целы. Но бросится ли в огонь собака… спасать котят? Вот взгляните на фото. Вы только посмотрите, какие у собаки испуганные глаза! Эта собака, рискуя жизнью, спасла помёт котят… да, котят! из горящего дома в городе Мельбурн, Австралия. Мельбурн найти довольно легко на карте - он на юго-востоке континента. Everybody is afraid of fire. Well, that's common knowledge. But life may prove it wrong. A mother will rush into a blaze to save her baby. A man would save a human being from a fire. Even animals can overcome fear of fire to save their young. We remember Scarlett the cat who saved her little ones from a fire. On a fine March day back in 1996, Scarlett was in an abandoned garage in Brooklyn, New York, when a fire started. The fire department got a call about the fire and put it out very quickly. When the fire was under control, one of the firefighters on the scene noticed Scarlett carrying her kittens away from the garage one by one. 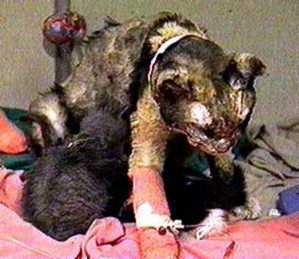 Scarlett herself was badly burned in the process of pulling her kittens from the fire. 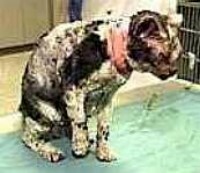 Her eyes were blistered shut, her ears badly burned, her paws and coat seriously burned. The hair on her face was almost completely burned away. After saving the kittens, and there were five of them, she was seen to touch each of them with her nose to make sure they were all there and alive, as the blisters on her eyes kept her from being able to see them. And then she collapsed unconscious. But surely a dog would not try and save kittens! Well, take a look at this photo. You can see fear in the dog's eyes. No wonder. This dog has risked its life to save a litter of newborn kittens from a house fire in Melbourne, Australia﻿. Yes, right! 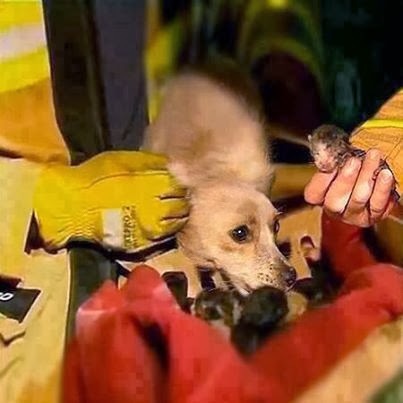 A dog has saved kittens from a house on fire!